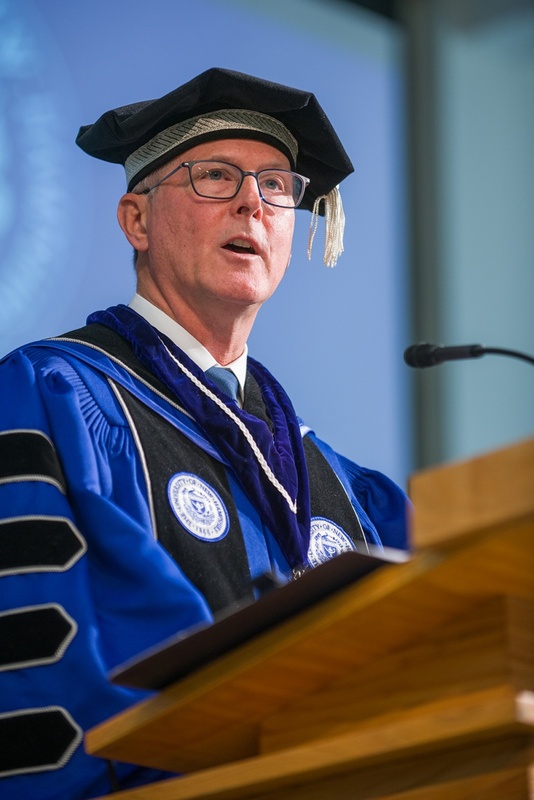 James W. (“Jim”) Dean, Jr. installed as the 20th president of the University of New Hampshire Friday, Oct. 12, 2018. DURHAM, N.H.—Surrounded by family, friends, trustees, members of the university community and alumni on campus to celebrate homecoming, James W. (“Jim”) Dean Jr. was installed as the 20th president of the University of New Hampshire Friday, Oct. 12, 2018. With more than 30 years of experience in public higher education, Dean was elected unanimously by the University System of New Hampshire board of trustees to lead the state’s flagship public university effective June 30, 2018. Dean addressed the crowd after being formally installed by John Small, chair of the USNH board of trustees, speaking passionately about the relationship between education and freedom, including freedom of expression. Dean identified the role of education in ensuring freedom of speech and expression, freedom of every person to worship God in his or her own way, freedom from want and freedom from fear. Watch or read his full speech here. Dean succeeds Mark W. Huddleston, who retired after 11 years leading UNH. Dean most recently served as executive vice chancellor and provost at the University of North Carolina Chapel Hill where he was a professor of organizational behavior. Caption: James W. (“Jim”) Dean Jr. installed as the 20th president of the University of New Hampshire Friday, Oct. 12, 2018. 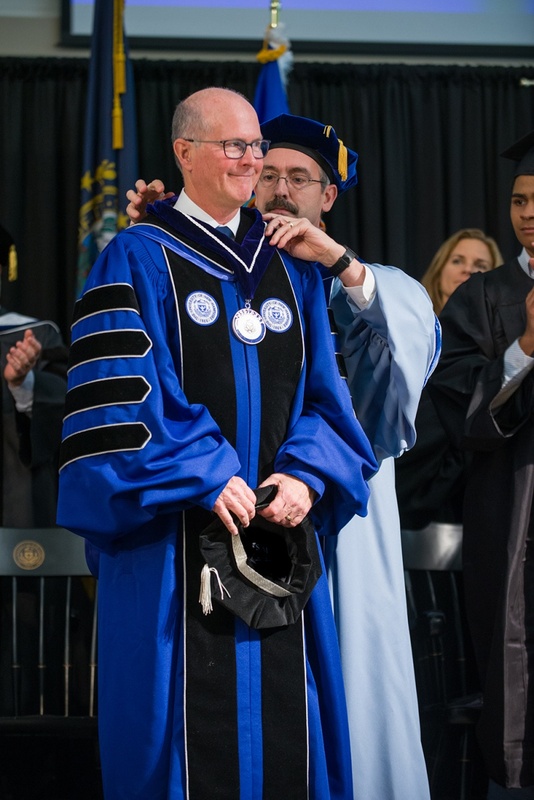 Caption: Newly installed UNH President James W. ("Jim") Dean Jr. receives medal from UNH Interim Provost Wayne Jones Jr.